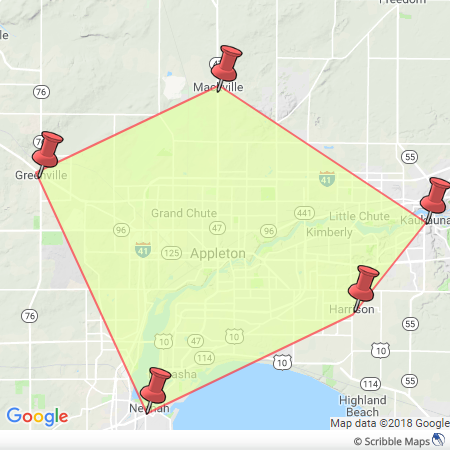 Local to Appleton WI Area Sales? Join this community to access great deals and transact with nearby sellers. Welcome to the Appleton Area VarageSale group! This group is dedicated to the Appleton WI Area. Anyone living in our membership area is welcome to join our group, but you must be willing to meet or pick up in our specified meeting area. 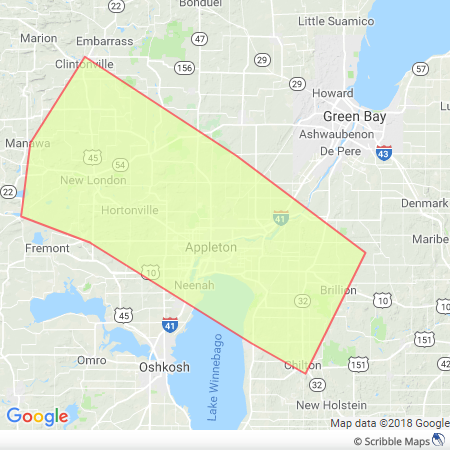 Meeting area map: Please note that all outlined locations on the border of the map, such as Greenville, Neenah, Kaukauna, Harrison and Mackville addresses are included in the meeting area for approved locations per the map along with all locations inside of the outlined area. The admin and moderators volunteer their time to manage the group and answer any questions you may have. A feeling of trust and community is vital to our platform and the admin and moderators use their discretion to determine whether a member is contributing to that feeling of trust and community. Admin reserves the right to remove all accounts associated with yours if you are removed from the group (husband, wife, mother, partner, fiancee, child). Admins are in charge and their decision is final. We simply will not deal with people who can't follow the rules or will not follow our instructions when resolving an issue. We work very hard without compensation to make this a great place to buy and sell for you. Each VarageSale community has its own set of rules, admin, and moderators. Corporate does not have any authority to change our decisions regarding members, so if you have an issue with how the group is being managed, please contact the admin of this group. If you have a group admin or moderator blocked, your account will automatically be suspended from the group. All members are required to use their real names for legal purposes and be at least 18 years old to become a member of our group. All members are required to have a visible photo of their face without sunglasses or filters as a profile picture (this can be a different pic than you use on other social media). If you are new to VarageSale or want to make sure you are not missing any of the awesome features, please watch the short videos below. 1st offense- You will be temporarily suspended for 24-48 hours. 2nd offense- You will be temporarily suspended for 7 – 21 days. 3rd offense- You will be permanently removed from the group. Admin reserves right to increase or decrease suspensions based on the circumstances. This does not matter if you have been a group member for 1 day or 4 years. Not “knowing” the group rules is not an acceptable excuse. Any reported and verified no show by a buyer or seller. Not going in the order of comments on your post to determine your buyer. Calling out a member publicly in the group or on Facebook. Requesting to meet out of our meeting area. Agreeing to accept a lower cost and then selling it to another member for your asking price. Accepting a buyer’s offer and then deciding not to sell the item. Deleting an item for sale after buyers have expressed interest in the item. Drama on the feed is a no/no. If you are having a problem with a group member, just contact admin/moderator and the issue will be resolved. Not stating in your item's description that your item is cross posted to other buy/sell formats. Buying and re-selling items within our group for profit is prohibited. Offering or accepting more than asking price for an item. Not responding to admin or moderators. Use of profanity in messages, comments or texts to admin, moderators and members is not allowed and is subject to immediate and permanent removal from our group. A suspended member is not allowed to conduct transactions with Appleton members during their suspension. A seller that schedules a pickup and forgets to leave the item out where they said it would be will be considered a "No Show." If a buyer does not show up for a scheduled appointment they will be considered a "No Show." The "first to comment" has dibs on the item. The seller must go in the order of the comments and not by any PM's received to determine your buyer. BOTH, a member asking a "question" on the post and a member hitting the "message button" are considered "COMMENTS". Please allow a minimum of 8 hours before moving to the "next" in line. The 8 hours is to allow the first to comment time to ask questions and negotiate. If the buyer sends you a message or comments on the post and passes within the first few minutes you may move on to the next in line. Mary: What size is this? Susan: "I'm interested in buying this item." In the above example, MARY has first dibs on the item. Do not sell to a member who has not commented on your post. Comments are the only way we admin can resolve a situation if need be. If you post an item for $15 and Mary offers you $12 and you say yes, you will need to sell the item to Mary for $12 even if Jane, Sue, and Nancy offer you $15. Tagging a friend does not put them or you in line to purchase. The tagged member is not in line to purchase until they comment on the post themselves. All prohibited items posted for sale will be removed. Here is the list of VarageSale's prohibited items: http://help.varagesale.com/article/371-what-items-are-not-allowed? In addition to VarageSale's prohibited item list, the Appleton group does not allow expired car seats, drop down cribs (even disassembled), adult items/adult novelty items, household pets, fireworks of any type and/or any type of firework accessory, OTC medication including diabetic testing supplies, CBD (Cannabidiol) products and oils, or expired food items to be posted. Any item that is labeled "free," "sample" or "not for resale" cannot be posted for sale with an asking price other than for "free" or "free with purchase." Sample formula cannot be posted as "free with purchase." It can only be given away or traded. FCFS (First Come First Serve) & "No Holds"
FCFS is NOT allowed in the Appleton group. Posts stating "No Holds" are not allowed. Stock photos (internet pictures) are not allowed as the main pic but they can be added as additional pics. You will need to take a pic of the actual item you have for the main photo. All posts with a stock photo as the main pic will be removed. You may post additional pics of the same item using the app or in the comment section of your post using a computer. As a seller, you must be willing to hold an item up to 48 hours for a buyer. You can post as many items as you want. One item per post and one category per item. A "group" of items may be posted but they must be sold for one price and not sold individually on that post. Not okay- 5 Shirts $4 each (this post will be removed). List your items separately if you want to sell them like this. Not okay- 5 shirts $20 or $4 each (this post will be removed). List your items separately if you want to sell them like this. Any post not in compliance with our group rules will be removed. Andrea: I will take the red pair and the two blue pair. Can meet you now with cash! Susan: I'm interested in buying this item"
Do not misrepresent or fail to disclose the condition of your items. Do not steal another member’s post. If you have the same item for sale, you will need to post it. If your item is sold in this group, please let the post self delete. The post will self delete in 7 days. This way the buyer and seller will get credit for the transaction and the transaction will be counted on the group's overall statistics. Posting personal or work phone numbers in your description is not allowed. Please send that information, if needed, in a message to your buyer at the appropriate time. If you are cross posting to other buy/sell formats, the description of your post should clearly state that your item is cross posted. “Cross posted” must be in each item's description and not just in the seller's profile. Acceptable abbreviations for “cross posted” are X-posted or CP. Should your item be cross posted and pending on another site, you will need to comment "pending on another site" on the item as this will keep your buyers informed. If you are cross posting to another VarageSale group, make sure you are willing to conduct your transactions in that group's area. If you need someone's permission to post an item please ask your spouse, child, relative or friend before you post and not after you post. Once you and the buyer have agreed on a meeting place or porch pickup, you will need to reserve the item for them. Please use the "I'm Having a Sale" category when you are advertising a sale on multiple items you have posted for sale. Once your sale has ended, please delete the post. All items must be priced. Items that are marked "Free" or “Sample” can be given away free but are not allowed to be sold. Under no circumstance are you allowed to raise your price after you have received comments on your item. Price reductions must be done by editing the post and not in the comment section of your post. If you need someone's permission to post and price an item, then please ask your spouse, child, relative or friend before you post and not after you post. Once you express interest (either by clicking the "message seller" button or commenting on the post) in an item, you have 8 hours to ask the seller questions, negotiate and schedule a meeting or the seller can move to the next in line. All negotiations and the scheduling of meetings should be done in a private message (PM) and not on the public feed or on your post. You must comment on a post if you wish to purchase an item. If you send a PM without commenting on the post, you will not be considered in line for the purchase. BOTH, asking a "question" and hitting the "message button" are considered "COMMENTS". Do not knowingly contact the seller and skip over a member who wanted to buy the item and commented before you. Once everything has been agreed, you will need to take the exact amount of cash needed for your purchase. Stop at a store on your way if needed to get change, but do not expect the seller to have change for a $100 bill if you are purchasing a $7.00 item. If you need someone's permission to purchase an item, please do not comment on it until you get their permission. Ask your spouse, child, relative or friend before expressing interest and not after you express interest. Please inspect all items before paying for them. While making arrangements for a meeting or porch pickup, ask the seller to reserve the item for you. Counterfeit items are not allowed to be posted and will be removed. Do not use trademark names (Coach, Pandora, True Religion, Michael Kors, Disney, etc.) unless your item is authentic. Do not steal another member’s “Looking For” post. If you are looking for the same item, you will need to make a separate post. Under certain circumstances, you can block another member. Childish behavior is not one of them. If you block a member because they pointed out the group rules to you or reported you to a group admin, you will be temporarily removed from the group for a period of 7 days. This will cancel all of your pending transactions. If a buyer does not wish to do a porch pickup because your home is out of the way or they don't feel comfortable going to a member's home, it is recommended that you find a way to work it out and meet at another agreed upon location. Should the buyer and seller arrange a porch pickup in a different area, that will be also allowed. Discussions are used for community information such as recommendations (contractors, dentists, childcare providers, etc.) and Public Notices (any claim to police reported activity requires a case number). The discussion area is not for the sale of items, rummage sale advertisement, or “ISO” posts. No member complaints allowed. Calling out a member publicly for a transaction issue will also get you temporarily suspended. If you have a transaction issue, contact an admin. You are welcome to advertise your business/home business in the More Categories/Small Business Directory Category with a pic, link, and phone number but you are NOT allowed to advertise your business/home business in the post of an item for sale. Each member is allowed to have one post in this category. You may delete your post and change it out as much as you wish. Admin assistance and tech support are available 24/7. There is an “ ? ” tab on every page. That's it, short & sweet. Enjoy the group!